1. Organic, fair trade coffee from Kansas City's The Roasterie. 2. Newman's Own organic coffee, distributed by Green Mountain Coffee, a company known for practicing social responsibility. 3. Fair trade and direct trade (meaning the company deals directly with the coffee roasters) brews from Stumptown Coffee. 4. 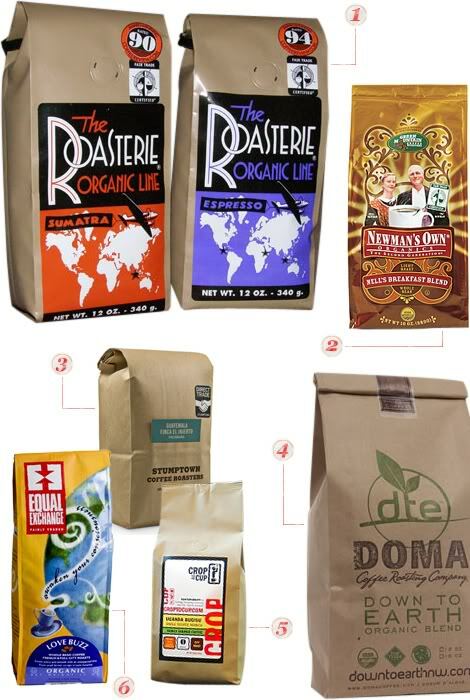 Founded by a husband and wife team, Doma Coffee offers organic, fair trade coffees and uses 100% biodegradable bags for retail and wholesale packaging, recycled office paper, and nontoxic cleaning agents. 5. Crop to Cup pays 20 percent premiums above the market rate in exchange for exceptional coffee to encourage small-batch farmers around the world to look at their coffee gardens as serious businesses. Five percent of each purchase is then reinvested in the coffee's origin community. And with their newly opened cafe, they're having an impact within the local Brooklyn community, too. Crop to Cup's shelves are stocked with locally-sourced products from small producers and will also be a delivery spot for those who sign up for Basis' Good Food to You drop off program, a weekly service that delivers locally-sourced fruit, produce, meat and dairy. 6. Massachusetts-based Equal Exchange has been promoting sustainably-grown goods since 1987. The company is worker-owned and offers fair trade coffee, tea, sugar packets and chocolate.